Soybean aphids can spread Soybean mosaic virus froim plant to plant as they feed. Soybean mosaic virus (SMV) infects mostly legumes, with soybean as the primary agronomic host. The main concern about SMV is the effect on seed quality. Virus-infected plants may produce fewer, smaller, and often mottled seed. 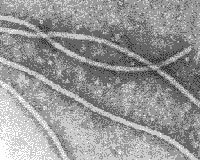 The virus consists of rod-shaped particles of RNA and protein that can only grow and reproduce inside a living plant cell. Like all viruses, SMV is not a cellular organism and can not spread by wind, water, soil or plant debris. Infected seed is the most important way that soybean mosaic virus is introduced into a soybean field. Seed transmission depends on variety, ranging from 5-75%. In most modern soybean varieties, rates of seed transmission are 0%-5%. Once the virus is in the field, aphids can spread it from plant to plant as they feed. Over 30 species of aphids transmit SMV worldwide. 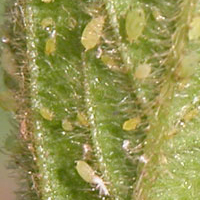 The soybean aphid, (Aphis glycines) is one of the aphids vectors of SMV. Mixed infections of two or more viruses in a single plant result in more severe symptoms than single infections. High yield losses can occur with combined infection that would not occur with infection by a single virus. Multiple virus infection also increases the level of seed transmission of SMV, depending how early in the season the plant is infected. With the recent increase in incidence of bean pod mottle virus (BPMV) in the region, the potential for synergism between SMV and BPMV has increased. Scout for foliar symptoms in cool weather during periods of active plant growth. 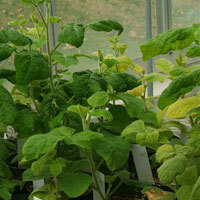 SMV infection is most apparant in the youngest leaves. Keep in mind that reaction of soybeans to SMV varies with soybean variety. Infected plants of some varieties may not show any foliar symptoms. Symptoms of virus infection are frequently associated with specific fields, especially those with moderate to high insect activity. There may be clusters of symptomatic plants or just single plants with symptoms. Check soybean seed for discoloration at maturity. 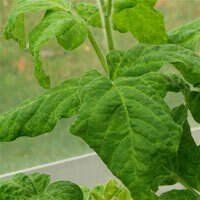 Rugosity (rough leaves), cupping, twisting and distortion of leaves are symptoms of both. These symptoms in the absence of a herbicide application may indicate a virus. Herbicide injury may follow a pattern, such as a spray swath, while virus infected plants appear in patches that are not consistent in size. Soybeans with herbicide injury outgrow the symptoms, while virus-infected plants may continue to show symptoms throughout the growing season. Note, however, that virus symptoms may be masked in hot dry weather. Foliar symptoms of SMV infection sometimes include a mosaic appearance consisting of light and dark green areas. General symptoms of SMV are plant stunting, leaf distortion and mottling, reduced pod numbers, and seed discoloration. Plant reaction to infection by SMV depends on the soybean variety. Leaf symptoms include a mosaic of light and dark green areas, chlorosis, rugose (rough) leaves, and leaf curl. The youngest and most rapidly growing leaves show the most symptoms. Symptoms are most severe at cooler temperatures (less than 25°C). Plants can be stunted, with shortened petioles and internodes. Symptoms can resemble injury from herbicide drift. Infected pods are small, flat, have less hair, and are more curved than pods that are not infected with virus. Seed discoloration may occur, and seed germination may be reduced. Particles of a potyvirus, similar to SMV - Photo: Rothamsted Experiment Station. Infection by Soybean mosaic virus alone does not generally affect yields. The major concern about this disease is seed quality. 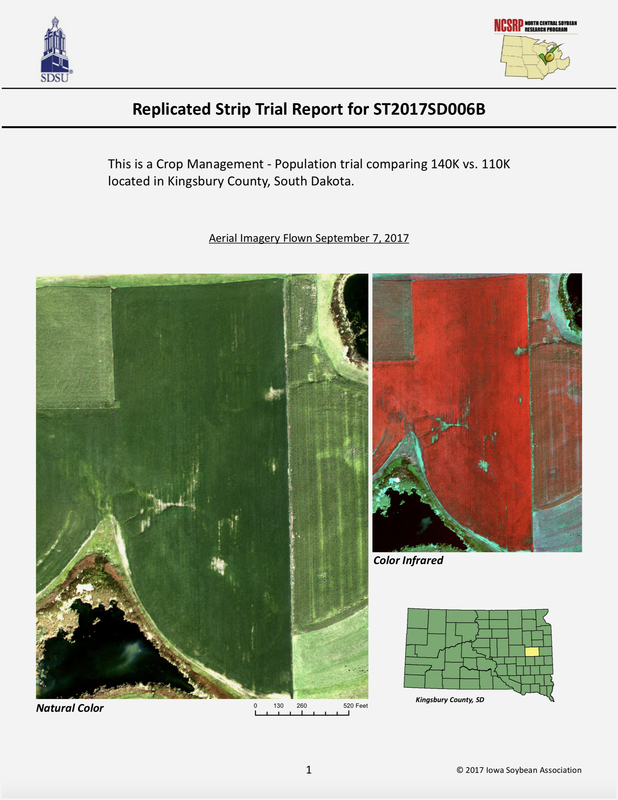 However, infection with more than one virus is common, and the risk of yield loss or reduced seed quality is much greater with a dual or multiple infection than with SMV alone. BPMV and/or AMV and TSV often occur with SMV in the same plant. Symptoms on plants with infected with both SMV and BPMV in particular can be very severe and terminal death may occur. High yield losses associated with combined infection have been reported. The combined infection also increases the level of seed transmission of SMV, depending on the plant when infection occurs. 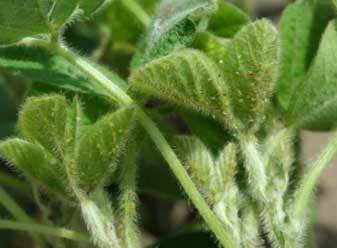 Soybeans infested with aphids are at increased risk of virus infection. Late planting coincides with higher populations of the soybean aphid and increases the probability of transmission to young seedlings. Infection in the early growth stages has the greatest risk of yield loss and reduced seed quality, compared to infection later in the season. Mixed infections with BPMV or other viruses can result is significantly more severe symptoms and yield loss. 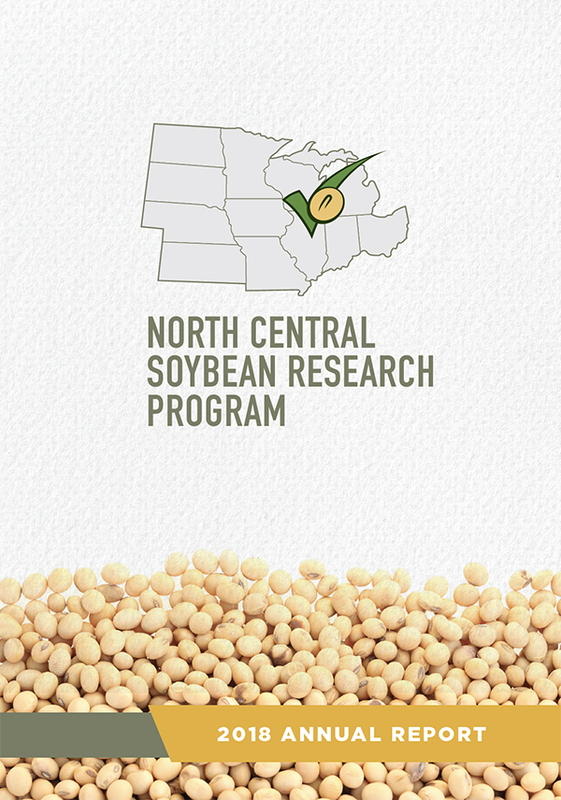 Identifying SMV-resistant soybean varieties is a high research priority in soybean production research. Photo courtsey of the University of Illinois. Infected seeds are the most important means that soybean mosaic virus is introduced into a soybean field. Therefore, planting SMV-free seed is an effective way of controlling the disease. SMV is seldom detected in weeds or other legume crops. Once established in a field, aphid vectors spread the virus when feeding. Late planting coincides with higher populations of the soybean aphid and increases the probability of transmission to young seedlings. Infection in the early growth stages has the greatest risk of yield loss and reduced seed quality, compared to infection later in the season. Disease resistance is the best long-term strategy to prevent yield losses from viruses. 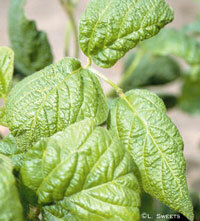 Growers are encouraged to ask their seed dealers about resistance to virus disease. Although most commercial soybean varieties are susceptible to SMV, resistance to SMV has been identified in soybean genotypes and varieties. Many promising genotypes have been identified in maturity groups appropriate for the North Central region and this remains a high research priority. It is likely that recommendations for SMV-resistant soybean varieties will be available to growers in the not-too-distant future. Several promising lines have common parental backgrounds. Parker, (Minnesota Agricultural Experiment Station), and Colfax (Nebraska Agricultural Experiment Station), expressed low symptom severity. Archer (Iowa Agricultural Experiment Station) was also identified as a common parent. A cooperative study in Iowa and Wisconsin, funded by checkoff dollars, was conducted to determine if foliar application of insecticide recommended to suppress aphid populations would also reduce disease caused by soybean mosaic virus. The study concluded that SMV control cannot be obtained, even though aphid populations were suppressed well. The reason is that the insecticide does not eliminate the impact of numerous aphid species immigrating into the soybean field from transmitting the virus. Since previous studies conducted in Iowa before the introduction of the soybean aphid showed rapid spread of soybean mosaic virus by an array of diverse migratory aphid species, the migratory form of the soybean aphid is just added to the menagerie of aphids moving through the fields to transmit the virus. The study also found that the colonizing form of the soybean aphid had little additional impact on disease spread, which was good news. So, since it doesn't take a lot of migratory aphids to generate a problem, the introduction of the soybean aphid into Iowa and Wisconsin will probably not make the problem worse; however, disease management cannot be obtained through attempts to control the aphids that transmit the virus. The bottom line is that you shouldn't spray an insecticide below the soybean threshold since using an insecticide will only suppress the vector but not the disease and may make the virus problem worse. Symptoms of SMV can be similar to other virus diseases. However, because virus infections involve specific combinations of virus, host, and vectors, the management strategies may be very different than for other viruses. If a virus problem is suspected, growers need to know the most prevalent virus or viruses involved. Most diagnostic clinics in the North Central region can perform serological tests that distinguish among soybean viruses. Early season infestation of Aphis glycines (soybean aphid). Photo: Chris DiFonzo.